Product Hero is our bi-weekly series to highlight outstanding members of the product management community. These industry leaders share tips on processes, team building, how to be a better product manager, and who they are outside of their careers. This week our product hero is Cait Porte, SVP of Product Experience at Zmags. Chris: Thanks so much for joining us Cait. Let’s start with you sharing your current role and responsibilities. Cait: I am currently the Vice President of Product for a company called Zmags. We are a platform that helps enable e-commerce marketing and content specialists to get content online without the barriers that are put in place by their IT teams. As the VP of Product, my primary responsibility is to execute on the product roadmap while getting feedback from the business, our customers, and the consumers of our products in order to most effectively build those products. I work very closely with our development teams, our marketing teams, and so forth to really make sure that we’re not only building the right products for our customers, but also executing those projects within scope and on time. Chris: What brought you into product management? Cait: Before I was in product management, I started out in event design and was given a really unique opportunity to do product management for the first company that I worked for, which was Experian. At the time, I had no idea what product management was and really grew into the role and learned to love it. The first product opportunity I had was to call all of the customers that had received a really terrible version of our product – it was an install product, so you had a physical CD-ROM, and you had to install it. All of the people that were given that product had terrible experiences, it wouldn’t work, it was broken; so my first product experience was calling all of those customers, understanding what their problems were, and reassuring them that we were going to do something to fix it. Ultimately, I would translate that feedback over to our development team and then execute on getting a product out the door to fix those problems. It was a really interesting opportunity, but the fact that product managers wear so many different hats, and operate in so many capacities, is what drew me to the role once I was aware of it. It was not something that I knew about prior to going into, it was something that I fell into. Chris: Awesome. It sounds like from day one you’ve been really tapped into the customer, what their journey is, and gaining feedback in relation to product. Can you talk a little bit about how you interact with users right now at Zmags? Cait: A variety of different ways, actually. This is probably par for the course for product management. In some capacities I’m doing usability and user experience testing with them. I’m working with our UX team right now to build out what those scenarios are, and to make sure that we’re listening to that feedback. In other scenarios, I’m understanding what our customers’ top priority issues are, whether as a company or specific to our products. We do something called the hundred dollar question: How would you spend one hundred dollars in our platform if you had only one hundred dollars to spend? It’s a great prioritization exercise to do with your customers. I also work on analytics with our customers because one of the things that we’re looking to do is build out an analytics dashboard – really understanding how they are measuring success, what factors are important to their business, what do they want to see in our products? I probably talk to customers at least once a day in some capacity, and I really like that because it grounds you when you’re thinking more strategically as a business. Hearing from the customers and understanding what their problems are is really critical for product managers and I like to make sure that I’ve kept that consistent through every role that I’ve been in. I probably talk to customers at least once a day in some capacity, and I really like that because it grounds you when you’re thinking more strategically as a business. Chris: Great. You mentioned leading the product roadmapping process and making sure that product is accurately in line with the roadmap. Can you tell me how you do product roadmapping at Zmags? Cait: One of the things that I constantly say is that product management is the art of managing a lot of lists. The reality is that while we feel like we have a single roadmap, we have actually have two sets of roadmaps. One of them you’re probably very familiar with, it’s the idea of the now-next-later concept, which we’ve adapted from a variety of sources, but Fresh Tilled Soil certainly influenced my roadmapping skillset. We operate that roadmap based on what are we doing in the next thirty days, what we are potentially doing in the thirty days after that, and then what we are doing thirty days after that. We’re looking at it in a three month execution phase. This gives our team perspective for what the development team is working on right now. We also have to think strategically. In addition to the now-next-later roadmap, we have a themed roadmap where we’re thinking about four themes. These are the areas that are going to strategically take our business to the next level. Within those categories we prioritize a list of features and we use the stack-rank method, also called an impact-ease analysis where we take a look at the customer impact and how easy it is for our development team to actually work on. The caveat there is that, whether the roadmap is strategic or tactical, you have to take into account the amount of time you’re putting on estimation. You can get really bogged down in saying, “okay, let’s look at all these features before we even pick one of them because we don’t want to go to our development team with the wrong one.” There’s a healthy balance that has to happen between execution, estimation, and preparation. We have effectively two different types of roadmaps, one that’s more strategic and one that’s a little bit more tactical. Product management is the art of managing a lot of lists. Chris: How do you measure the success of your product? Cait: In a variety of ways. I think that measuring success is one of the hardest things to do as a product manager. There are a few ways that we measure things. First, we look at the data. For example, we looked at how many people were clicking on a button when it was one way, and we made a change and we recorded how many people clicked on it now that it’s a little bit more clear. We saw an 80% increase in the number of clicks, which is great. This is a very metrics driven approach. Next, you have to think about your feature or features more strategically. Our product is a software as a service product and we think about renewals, customer happiness, and utility of the product. One of the metrics we look at is our overall renewal rate and why we’re losing customers. As a business, we try to keep a pretty ambitious renewal rate, we’re looking at 92-95% renewal rate. There’s a very, very thin margin for error there. How do our product’s features really influence what that renewal rate looks like? When we hear from customers that are not renewing, my team tries to uncover why they aren’t renewing. Ultimately, what we want to hear is that it’s more of a business decision and nothing related to what our product does or does not do. There’s a lot that goes into success. I think there’s success in terms of how we’re doing as a business, and success in terms of how we’re doing as a team, so we take all of those factors into account. Sometimes it’s very data specific and we can get really nice metrics that look great on paper, and other times it’s a little bit more… I call it touchy-feely, that’s the stuff you can’t really measure. Chris: If you had to go back in time and give your young product management self some advice, what would you tell past Cait? Cait: I would probably say patience is a virtue. I tend to be somebody who is always going, always looking for the next thing. I’m very driven, very motivated, really energetic, and I like things that can happen right away. I want them to happen yesterday. As I’ve grown in my product career I’ve realized that sometimes patience is really, really valuable because you can get more feedback, you can digest things a little bit better. When I think back to my early product career, I wouldn’t understand why we weren’t getting something done faster. Why is it going to take us so long to do x-y-z? As I’ve grown into this new role, and watched myself evolve and watched others evolve, I think having patience is really important. Particularly as a product manager, to understand that there’s a lot more complexity than “build this feature, get it out the door, and then build the next one.” I would probably tell myself to just be a little bit more patient, both with process and with people. Chris: What’s the best piece of professional advice you’ve received along your career journey? Cait: The best piece of professional advice came in the form of a concept called NIHITO. It stands for Nothing Interesting Happens In The Office. It could apply to any role. It certainly helps me as a product manager. The idea that we get so bogged down by just sitting in our desks, doing what we’re doing, getting into this daily routine, that we forget who we are building the products for, or the people on our team, or the other companies that are our partners, or why we are doing this. Whatever ‘this’ is. Just to get up, not necessarily out of the office if you can’t do that, but just to get up and move around and just see things from a different perspective has been probably the best thing that I try to pass on to others. I think that it’s so valuable to think about, whether it’s talking to customers or getting new perspectives. You think about being able to go on one customer visit and it opens your eyes to see, “wow they’re using our product in a completely different capacity,” or “I really thought that this person wasn’t gelling with me because they were concerned with this thing but it turns out we are trying to achieve the same goal.” Taking those blinders off, getting outside of your comfort zone, getting outside of your space, has been a real eye opener for me. The best piece of professional advice came in the form of a concept called NIHITO. It stands for Nothing Interesting Happens In The Office. Chris: What’s next in the e-commerce space from a user experience point of view or a product point of view? What do you see coming as a trend? Cait: If I think about what my customers are asking for, there’s two things. The first is personalization and this is both from the standpoint of the consumer and for the retailer. As a consumer, I want my experience to feel personal. I want to feel like I walk into this store, or I buy this item online, and it’s different for me than it is for everyone else, because I’m special. I recognize that the business that I’m buying from treats me that way. If you think about companies like Nordstrom and Zappos who have really exceeded with customer service, it’s partially because of this personalization aspect where they’re spending the time with you, they’re taking the time. I think that you start to see trends emerging with data where personalization becomes huge. If it’s raining and I go to Nordstrom.com, and I’m in Boston, maybe I want to see trench-coats because that’s kind of the mood I’m in or the mentality I’m in. If it starts to get cold in Boston, all of a sudden I see those products that make the most sense for my area. You think about personalizations within marketing and email campaigns, but also in terms of your experience on the site itself and then what that translates to in-store. A little bit of personalization and what that influence looks like when it comes to omnichannel. I think that’s one big one. The other area that I think is really important is data, and empowering our retailers to have as much data as possible about whatever product or service that you’re offering. You see companies like IBM Watson that’s coming out and they have all kinds of powerful information. You want to make sure that your product is armed with data, but that your staff and your organization are armed with the skillset to digest that information and make meaningful decisions because of it. I think specifically within e-commerce, personalization is a huge one and then data driven decisions – I don’t think either is new but the knowledge base and the knowledge gap that exists today is really going to need to change pretty soon. Chris: What are some things that you like to do when you’re not at work? Cait: I’m really passionate about the product management community in general, and really building up the discipline of product management. 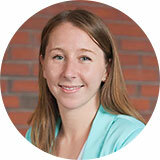 I teach at General Assembly and I am also a co-founder of the Boston Women in Product group. I’m also on the board of directors for the Boston Product Management Association and I run their mentorship program. The consistent theme there is really elevating the role of product management, making it more of a discipline, and building a community in Boston. I have two dogs and I love training them. I have one with me actually right now. They take up a huge part of our time, my husband and myself. One of them is a therapy dog, the other one is working on it. We do a lot with them, we have a lot of fun, and it gives us the chance to go out and give back to that community in Boston. The product management community and doing a lot of dog training keep me pretty busy. Chris: Can you talk a little bit about Boston Women in Product? What your mission is and the state of women being in product because it’s such a male dominated field. Cait: We co-founded the Boston Women in Product group as kind of an outcry for what we were looking for. We were looking for mentorship opportunities in the community and the mission of the Boston Women in Product group is really to facilitate the community of building women in product roles. We have a variety of different events. We went from zero in February to now having over 400 members, which is phenomenal, it’s been eight months. We’ve seen huge growth. Every event we have continues to have more attendees. We ran a workshop recently on finding a mentor and getting career advice. It was more of a round table, speed dating discussion that happened, where we paired people together for ten minutes at a time and then they rotated. That was really, really successful. We are planning on running another workshop coming up where we’re going through best practices for building out your resume and then making sure you nail that first interview. We really run the gamut of both career building and then just product knowledge. Tackling these really hard product problems. How do you build an MVP? How do you deal with your development teams? How do you structure the conversation with your boss around promotion or challenges at work? We really like to foster the idea of community in Boston, and what I love about the group is that while we certainly do focus on women in product roles, we get a really nice percentage of men coming to our events. Our last event was split 50-50, men and women. We like to encourage everyone to attend our events. That’s just what we were founded on. It’s been a really fun opportunity for all of us. Chris: What’s your morning ritual like? What’s that one thing you do that sets the tone for your day? Cait: My day starts really early. I try to be into work by 6:00 because my development team is over in Denmark and I try to get the most out of my day, so 6am is when I start. When I put my feet on the ground, as soon as I get out of bed, I say ‘thank you’. I just appreciate the day. As crazy as it sounds, and as cliché as it sounds, just getting up and appreciating the day that you have in front of you is probably the first thing that I try to think about. Then I immediately go to my phone and see if there’s anything crazy happening. I get out of bed, I look at my phone, I jump in the shower, and I kick my day off from there. When I sit down and I get to work, take a deep breath, check a couple of my emails, and am really appreciative. I’m doing what I love to do and I’m working with a team that I love to be working with. I think appreciation and gratitude are things I like to start my day with. Chris: That’s great! Well thank you so much for taking the time today Cait. Your insights and the work you’ve done for the Boston product community are truly appreciated. Thank you for being a product hero. Cait talks to customers at least once a day to keep grounded in why she is building product at Zmags. On the latest trends in e-commerce: 1) personalization of content based on past browsing behavior or local weather conditions, for example and 2) empowering retailers with customer data to make meaningful decisions. Get in touch with Cait across the web on her website, blog, Twitter, and LinkedIn. Chris is a high-energy marketer focusing on content creation, events, lead generation, and developing deeper, more meaningful relationships with Fresh Tilled Soil’s clients. He brings out-of-the-box creative flair to every challenge along with keen attention to detail.